Whether you’re branding a new business or refreshing an old logo, there’s a million designers for hire. Even for as little as $5. The big difference between them and us is the strategy behind your design. The Impulse team uses a buyer-centric approach in all of our creative work. While any designer can give you a nice graphic to represent your business, Impulse Creative can ensure that logo is targeting the right people and saying the right (sometimes unspoken) message. The right logo is an investment, expertly designed to fuel your sales. Don’t settle for less. At Impulse Creative, you’re a part of the process, working directly with our team to ensure you’re happy, confident and successful. We’ll start by learning about your business, ideal customers, challenges, likes or dislikes and how buyers interact with your brand. This step is crucial to tying your logo into your company’s story and buyer’s journey. Next, sketches and industry research help us to forecast trends and ensure your logo design stands out, while still fitting in. Choose from 3 distinct directions, then explore color options as you work with us through constant collaboration. No matter where you’re located, our team can work with you to create a logo design that does more than you ever knew it could. Our five-step logo design process typically takes 3-6 weeks from our first meeting to handing over your complete design files. Get everything you need, including data-driven marketing insight, to start promoting your brand, with or without us. We can even handle printing for you! Recruit the Impulse Creative Team to define and develop your company’s brand plan with an exclusive hands-on Brand Workshop. Get the highest quality printed materials and merchandise to support your brand and in-person marketing efforts. No matter where you’re located, our team at Impulse Creative can create a logo design that targets the right people and portrays the right message. Whether you're branding a new company or rebranding your business, it takes an entire team of marketing, sales, design, content and development experts to do it right. Web Design is the foundation of your marketing strategy and the home of your brand identity. It’s the face of your company as people consider how to solve a problem. 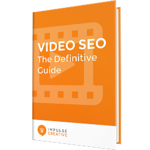 Our Free Guide will outline the SEO tactics to help you gain more exposure for the videos you spend so much time creating.